Objective: Stabilise the ankle joint (talocrural and subtalar joints) against too great a lateral twist (supination and pronation) without reducing the normal mobility of the ankle joint (plantar and dorsal flexion). 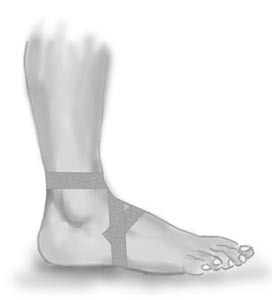 With a heavy sprain the applications include “stirrups”, “ankle lock” and possibly “figure-8”, however, light sprains normally require just “stirrups”. The tape is utilised the whole day in the beginning of the course, being gradually reduced over the following three months. The tape is finally only used in connection with particular loads where there is risk attached. Application: Begin just in front of the ankle joint and draw the tape in under the arch of the foot on the inner side, and up over the outer side, continuing over the start tape in front of the ankle joint and round behind the leg and back again to finish in front of the ankle joint.